Signed and dated lower c., pencil "Nolan/ 49". 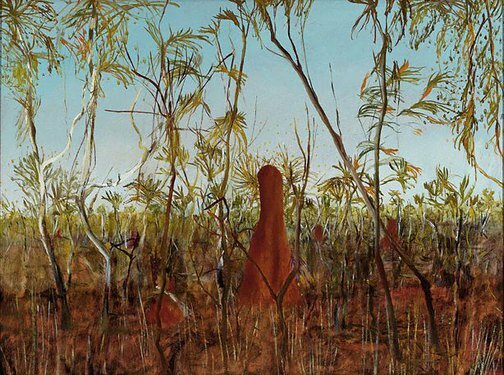 Sidney Nolan - landscapes and legends: a retrospective exhibition 1937 - 1987 , 'Inland Australia', pg. 109-110, Sydney, 1987, 109. F.L., The Sydney Morning Herald , 'Art Gallery's ''Reckless" Acquistions', Sydney, 15 Feb 1951, unknown. James Gleeson, Sun , 'Landscapes triumph for Aust. artist', pg. 19, Sydney, 31 Mar 1950, 19. Hal Missingham, Art Gallery of New South Wales Quarterly , 'Sidney Nolan', pg. 362-371, Sydney, Oct 1967, 366 (illus.). Sidney Nolan - Australia , Sydney, 1979, 104, 105 (colour illus.). A catalogue of Australian oil paintings in the National Art Gallery of New South Wales 1875-1952 , Sydney, 1953, 154. cat.no. 494; Provenance: purchased by the Trustees, 30/3/1950, from the exhibition of the artist's work held at David Jones's Art Gallery. Geoffrey Smith, gallery: ngv members magazine , 'Sidney Nolan: Desert & Drought', pg. 4-7, Melbourne, Jul 2003. NOTE: General reference. Article on the Nolan Desert & Drought exhibition at NGV. Sidney Nolan , London, 1961, 43-45. Editor Unknown (Editor), Sun-Herald , 'We own many treasures, but few realise it, so', Sydney, 19 Nov 1950, unknown.